For exclusive content that includes industry specific insight, sales & marketing tips to get you more leads, as well as expert advice from our team as to how deposit bonds can help you close more deals. Please enter your name, email and select your industry to get started. Get more from deposit bonds for both your business and your clients. Deposit Assure will help you every step of the way. Everything from our deposit bond concierge service to our partner portal is designed to help you extract maximum value from deposit bonds for both your business and your clients. #4 Close the deal when developers, vendors & their legal representatives as well as financiers specifically request deposit bonds backed by QBE Insurance (Australia) Ltd.
Our Deposit Bond Concierge Service was conceived by mortgage brokers for mortgage brokers. Simply refer your client to Deposit Assure and we do the rest. You have no forms to fill out and paperwork to chase – our concierge team will take care of the whole process, so you can focus on what you do best. With expert support from our team, you’ll know your client is in safe hands. Gain the confidence that comes with using deposit bonds backed by one of Australia’s most recognised and trusted insurers. Deposit Assure bonds are underwritten by QBE Insurance (Australia) Limited, an A+ Stable credit rated insurance partner. #3 Acceptance: Where deposit bonds are accepted, Deposit Assure and QBE backed deposit bonds are accepted everywhere. Gain complete visibility over your clients’ deposit bond applications from start to finish in our partner portal. See what stage each application is up to. Search current and past deposit bond applications. Stay informed about any queries as they happen. You can even email a copy of the deposit bond straight from the portal. Our partner portal makes it easy! Take the guesswork out of deposit bonds with ready-made resources and training for brokers. As a Deposit Assure partner, you can access comprehensive marketing tools and templates to engage and educate clients on the value of deposit bonds. Best of all, we can personalise the marketing materials so your brand is front and centre. Simply email bonds@depositassure.com.au with your client’s Fact Find/CNA and any other supporting documents we require (check out our portfolio and requirements here). Or apply using our Express or Standard online applications. Start lodging deposit bonds for your client and generate commission as an accredited referrer of Deposit Assure. 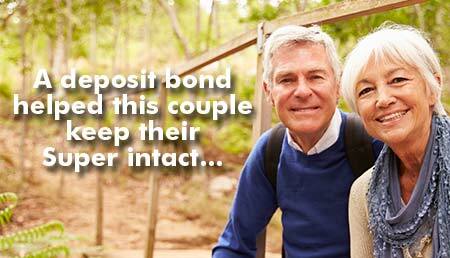 More and more Australian brokers are partnering with Deposit Assure to provide deposit bonds for their clients. We’re also backed by a growing number of aggregators as a trusted supplier of deposit bonds. #4 Deposit Assure will countersign, send you copy of your accreditation agreement and grant you full access to the portal. Click here to complete your accreditation with Deposit Assure. Got an urgent Deposit Bond? Don’t let the accreditation hold you up. Get your clients deposit bond application underway and once your accreditation is complete (normally in 1 business day) we will retrospectively attribute your referral to your profile. Seeing other people’s dreams come true is pretty magical. Especially when it could be you. Ever wondered where deposit bonds came from? Deposit bonds, also known as deposit guarantees, have been helping Australians buy houses for almost two decades. So how did it all begin?